Pepper spray burns, Tranquility Bay, Jamaica. *Pepper spray was used as a form of punishment and restraint. Isolation rooms used as punishment - Cross Creek, Utah. 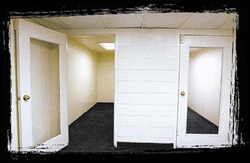 *Students report spending up to 18hrs straight in an "R&R" restraint position in these rooms, and even occasionally overnight. 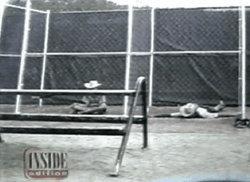 A restraint position in an isolation cage, High Impact, Mexico. 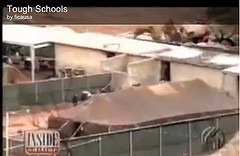 *These cages are unsheltered by the Mexican sun. *Students report spending up to 18hrs straight in a restraint position in these cages. 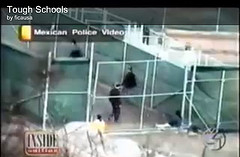 Isolation cages used as punishment - High Impact, Mexico. *Students report spending up to 18hrs straight in an R&R restraint position in these cages. 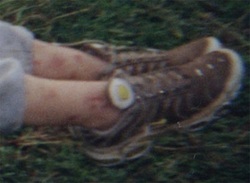 *See close up of student's ankle injuries below. 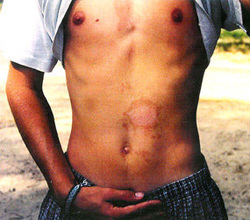 Injuries from restraint positions - Paradise Cove Academy, Samoa. *Students report being "hog-tied" as one form of R&R restraint position used here. R&R restraint positions used as punishment - Tranquility Bay, Jamaica. *Many students from various WWASP schools still have terrible scars on their chins from being physically forced into this R&R position. "Group session" - Tranquility Bay, Jamaica. *Punished students were not allowed to look up from the ground.